^ 3.0 3.1 3.2 周德庆. 微生物学教程 （第二版）. 北京: 高等教育出版社. 2002: 293. ISBN 978-7040-1111-63. ^ Linderkamp O, Ruef P, Brenner B, Gulbins E, Lang F. Passive deformability of mature, immature, and active neutrophils in healthy and septicemic neonates. Pediatr. Res. December 1998, 44 (6): 946–50 [2009-04-06]. PMID 9853933. doi:10.1203/00006450-199812000-00021. ^ Soehnlein O, Kenne E, Rotzius P, Eriksson EE, Lindbom L. Neutrophil secretion products regulate anti-bacterial activity in monocytes and macrophages. Clin. Exp. Immunol. January 2008, 151 (1): 139–45 [March 29, 2009]. PMC 2276935. PMID 17991288. doi:10.1111/j.1365-2249.2007.03532.x. ^ 10.0 10.1 10.2 Mayer, Gene. Immunology — Chapter One: Innate (non-specific) Immunity. Microbiology and Immunology On-Line Textbook. USC School of Medicine. 2006 [November 12, 2008]. ^ 12.0 12.1 Hess, Charles E. Segmented Eosinophil. University of Virginia Health System. [2009-04-10]. ^ 13.0 13.1 Baron, Samuel (editor). Medical Microbiology (4th edition). EditionThe University of Texas Medical Branch at Galveston. 1996. ISBN 0-9631172-1-1. ^ Gleich GJ, Adolphson CR. The eosinophilic leukocyte: structure and function. Advances in Immunology. 1986, 39: 177–253. PMID 3538819. doi:10.1016/S0065-2776(08)60351-X. ^ Akuthota P, Wang HB, Spencer LA, Weller PF. Immunoregulatory roles of eosinophils: a new look at a familiar cell. Clinical and Experimental Allergy : Journal of the British Society for Allergy and Clinical Immunology. August 2008, 38 (8): 1254–63. PMC 2735457. PMID 18727793. doi:10.1111/j.1365-2222.2008.03037.x. ^ Kariyawasam HH, Robinson DS. The eosinophil: the cell and its weapons, the cytokines, its locations. Seminars in Respiratory and Critical Care Medicine. April 2006, 27 (2): 117–27. PMID 16612762. doi:10.1055/s-2006-939514. 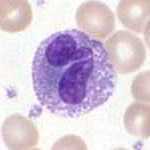 ^ Hess, Charles E. Mature Basophil. University of Virginia Health System. [2009-04-10]. Delves, P.J., Martin, S. J., Burton, D. R. and Roit I.M. Roitt's Essential Immunology (11th edition), Blackwell Publishing, 2006, ISBN 978-1-4051-3603-7. Hoffbrand, A.V., Pettit, J.E. and Moss, P.A.H., Essential Haematology (4th edition), Blackwell Science, 2005, ISBN 0-632-05153-1. Paoletti R., Notario A. and Ricevuti G., (editors), Phagocytes: Biology, Physiology, Pathology, and Pharmacotherapeutics, The New York Academy of Sciences, 1997, ISBN 1-57331-102-2.